Christians in Context: from orthodoxy to orthopraxy. : The Emerging Fad? Some of you may see the title of this post and skip it if for no other reason than that you are tired of seeing Emergent-bashing on this blog. Heck, even if you aren't tired of "bashing," maybe you're just tired of the topic itself. And I understand that. When all of this Emergent stuff got going I took some comfort in the thought that it was just another church fad that would get its fifteen minutes of fame before fading away into relative unimportance. And frankly it does appear to me that some of the early names in the movement are starting to lose a little bit of the flurry that first surrounded them. 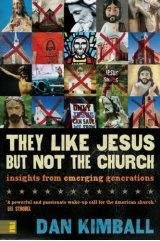 But an important realization hit me yesterday as I began reading Dan Kimball's They Like Jesus but Not the Church: there is a real, serious problem that the Emergent movement is really, seriously trying to address, and we need to really, seriously do the same thing. Now I am not entirely sure that the Emergent movement will prove itself to be the answer, especially not in its early, more radical forms. In fact I find Kimball's thought in general to be much more palatable than others because he seems less extreme, and, well, less obnoxious (if I can be frank, and that of course isn't to say that us non-Emergents are never obnoxious). The fact of the matter is that megachurches reach the boomer generation but utterly fail to reach the 18 to 30 year olds. Attractional churches don't attract young people, plain and simple. This problem has become so real to me that I even find myself driving past large church buildings and thinking, "When all of the adults who go there now kick the bucket in however many years, that church will be empty." Is the Emergent movement itself a fad? I'm not sure yet. But I am really confident that we need to take seriously the realization that they have been much quicker in coming to than most of us non-Emergents, namely that America is rapidly becoming post-Christian, and we who want to see the name of Christ glorified by the most people possible need to be serious about how to reach the emerging generation with the gospel. So yes, I'm even a little sick of all this Emergent talk myself. But heed their urgency and think seriously about how the church accomplishes its mission to the world in America. Maybe that's why yet one more post on the Emergent movement is worth our time. While I certainly don't agree with some of your thoughts or ideas (so what?) I appreciate your polite discourse when discussing topics. As a one-time evangelical now mainliner/emergent I think you are correct. Megachurches, primarily evangelical or at least evangelical in theology if not name, do primarily attract boomers and their kids. Heck, my church's "contemporary" service shows the same trend with a few members of the "I can't get up in time to make the 8:30 service" younger crowd. And they have asked me where the traditional service is at 11:00. Megachurches usually don't see this trend because frankly, it isn't in the current power holders interest to sound the alarm. After all, the pews/stadium seats are packed, the budget is large, and my salary and pension are secure. Don't mess with it if it isn't broken, right? Mainline churches have been haunted by this trend for years. Many, many think they have to copy the worship patterns of the megachurches, but a growing number are looking past the "one stop shopping" of the megachurch and embracing ancient spiritual practices. And guess what? So are the emergents. The theology is often still different, but the focus is the same...to move past a life that "learns" about God to a life that "experiences" God. i think the emerging church connects with a psychographic - not a demographic. emergence to understand why this is - i.e. we can't envision a honeycomb by looking at a few bees). but i assure you i'm not trying to be cool or edgy or do the next thing. i don’t think the kingdom of god has anything to do with being cool or edgy. i appreciate when mainliners (and i just sat with another one last night at the northern va emergent cohort) are part of congregations that recognize their church is dying - and want to breathe in new life (or "bring in the young people" as they say - another misplaced reference to this being a demographic) but want to do it without changing anything. my pain tho, is i don't believe you can do this even a little at a time. i believe you have to rethink everything. at once. literally bury your church and start over with a few people who want to do this. and without a designated leader. and because of that, and despite the nobleness of the loyalty so many have to their denominations, i don’t know how the leaders (pastors) will do this, or how the denominations will survive the transition (hold for a remnant). its sobering. I know I hold to a minority opinion but I do believe that the real reason is that simply most churches in the states preach a decisional regeneration Gospel that produces false converts and not real Christ followers. Any person who would stop fellowship over music style or clothes really shows something about the state of their soul. This is not about music or youth groups but about the fact that America is becoming more like Europe. Cultural Christianity is dying and those who hold to Biblical truth are becoming a minority (hold to does not mean saved necessarily). I think the issue is larger than distinguishing between "learning about" God and "experiencing" God (which I think is probably a false dichotomy). I also think it is bigger than ancient spiritual practices vs. modern worship (even most Emergents that I have interacted with have not wanted icons and candles to be the focus of what they believe). What do I think it is about? I think it is about fundamentally how we view the way in which the gospel expands: do we bring people to us, or do we go to people? It seems to me that most megachurches are in some sense built on that attractional model. Evidence for that is simple: how much time, talent, and treasure is spent on Sunday mornings? Too much, because it isn't working. Willow Creek (and others) has found out that even the people that are coming to church are not begin changed enough, and Dan Kimball (and others) has found out that 18-30 year olds don't bother coming in the first place. I do appreciate your commendation of my tone (yours too, P3- and for the record, what's your actual name? ), by the way- I see the same in your response and appreciate that. It is really encouraging, as I do try to make serious effort to do this. But that last comment from Damian there is actually from me. What do you propose is the alternative gospel? Good post, Andrew. Have you read "The Shaping of Things to Come"? Swell stuff on missional versus attractional thinking. I think everyone has made some great points, and I agree with much of what you've all said. However, I also think that the generalizations about pastors are inaccurate. Brian, stating that many pastors of mega churches are more concerned with their financial well being than the condition of their flock is quite a severe indictment of their character. And Grigs, saying that most churches in the states preach a gospel that produces false converts implies that most pastors in the states are leading their flocks astray. Are there pastors who base their decisions on money or teach false doctrine? Absolutely. But lumping a majority of pastors into these categories seems unfair. Stephen Crittenden: With a rock band on the stage or the altar? Johnny Baker: Yes, it just doesn't touch those kind of realities. So I think alternative worship was wanting to kind of re-engage with the depth of tradition but in a way that connected with postmodern culture. I think what we've done is to take some of the liturgies and historic practices of the church, whether that would be praying with icons or the communion service or something like the labyrinth." Although that excerpt is specifically discussing ways of worship, it speaks about the real need, as opposed to a generated need, for people to actually "connect" and "encounter" the mystery of God. Emergents, and of course this is a generalization, find the Disneyesque show put on by a Willow Creek to just not open that door to the mystery. So, and in a rather long winded way, I would say we are both correct. Jenny, I certainly agree that there are many fine pastors of megachurches who don't follow the dollar. However, and this is from personal experience and plenty of conversations with others in ministry, when a church reaches a certain point in budget and the activities it supports, pastors have to be very, very sensitive to the financial bottom line. A great example of a pastor who didn't is the Pentecostal pastor, Carlton Pearson in Tulsa. A rising star in this denomination, pastor of a very, very large church. But he came, and still does, to believe that God will save everyone. This "broke faith" with a core tenant of Pentecostalism, and frankly, a strong belief used to control the flock. He lost thousand of members, a huge budget, and standing in his faith community. Whether you believe in his specific ideas or not, this is what usually happens when you don't color inside the party lines. i'm a big fan of Dan Kimball. I've had the privilege of spending some time with Dan and he's a very trustworthy and thoughtful soul. whether or not the emergent/emerging church is a fad or not, i am not entirely sure how to answer that question. that said, i do firmly believe that the folks involved in the emerging christian perspective are pointing towards a trend that is ultimately inevitable. the christian faith tradition will continue to evolve, move, grow in ways we simply are not completely sure of. if the course of history tells us anything at all, it rings loud and clear that we will evolve in ways we can't easily predict. my view is that the emergents are simply listening, contemplating, experimenting with finding out where this inevitable evolution will take us. sadly, for the past handful of decades (and likely long before that), the narcissism of the boomers has convinced the masses that we have it sorted out. that somehow, from now on our understanding of the christian faith will remain as it is forever and whoever challenges that notion is filed in the bin of heresy. the only relenting that we've seemed to bring ourselves to is the evolution of our methods. but we also need to be aware of the inevitable evolution of our understanding. I think that is why the emergent voices are connecting with many believers.